Automatically search & locate OST files in the user machine. Preview emails of OST file in different 7+ email previews. Provision to convert multiple OST Emails to MSG file format. 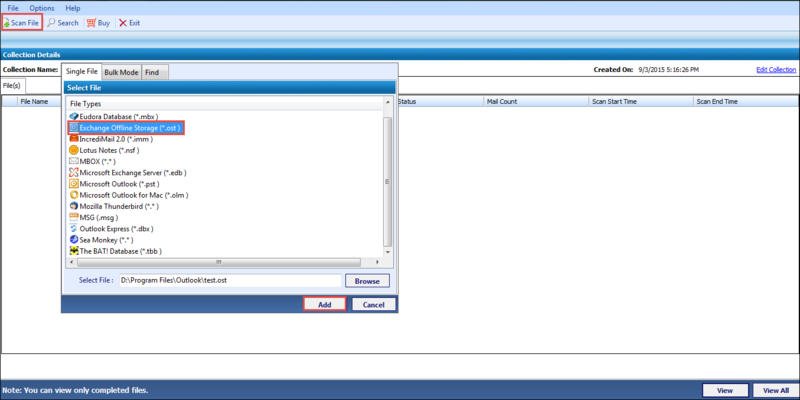 Perform advance search for specific mails in the OST file. Option of selective conversion of emails/folder available. Apart from OST to MSG, the software migrate OST files in more than seven file formats. Give details like title, collection path & description to add. Then after, preview files in 8+ modes provided by software. Perform search via advance search option provided by software with facility to save searched data. Select email file in destination. Optimize data with export options. Provide desired location to save file. Click on OK to start the final conversion process. Being the Technical Manager, I have to pay more attention to the smooth functioning of all the utilities being used on a routine basis. From last 3-4 days, some problem has occurred in email client, Employees are unable to perform their task efficiently. Every time they tried to run, it pops up with the error that your profile cannot be accessed. I have practiced all the methods for retrieval of data but the outcomes are not satisfactory. I want to convert all the data of employees about 20GB to file format which can be easily be viewed in the text editor or another email platform as well.. Does the software perform batch conversion of OST file to MSG? What is the pre-requisite of Software? Is the Software maintains the Folder Structure of OST emails? Can I convert selective emails to MSG? Is there any limitation imposed by software on the size of OST file? How can I avoid converting duplicate emails in OST file from being converted to MSG format? For avoiding the duplicate emails from being converted to MSG format, you will need to select Exclude Duplicates option in the software. Will the software converts corrupted OST emails to MSG format? Yes, the OST Emails to MSG conversion software will recover the deleted or corrupted mails and will convert them in to MSG format. Is Outlook installation necessary for performing the conversion process? No, it is not necessary to install MS Outlook in the machine to perform the conversion process. How will I search for the emails that contain specific words in them? You can select advance-searching option and can search for the emails that contain the desired keywords by entering the required words in the search box. OST to MSG Converter with its advanced features enabled us to convert a large number of OST files to MSG format, without any issue. It is easy to use software that even a non-tech user can conveniently work with. OST file gets easily corrupt for multiple reasons as a result of which user is unable to view the content of OST file then to view the content of OST file in simple text editor, it needs to convert into MSG file. To perform the conversion of ost to msg you need this tool.